OPTISORB 40, 2 x 30 Litre (15kg) bag- absorbs the spill and solidify large volumes of spilt liquid. Although small in size, will absorb up to 30 litres of liquid. MINIBOOMS, 6 x 3.0m x 75mm- use to absorb the spilt chemical, contain or divert the spill; to surround leaking drums and containers to prevent the spill from spreading; to protect drains by placing booms in front of or around the drain; to divert the spill away from drains, stock or equipment to an area where the spill can be cleaned up. 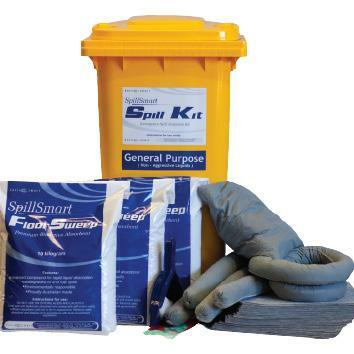 PADS, 100 x 450mm x 450mm x 200gsm, Regular thickness- Use to absorb and clean up the spill, to wipe down clothing, hands, floor, containers, drums etc., contaminated by the spill; use behind the booms to absorb any seepage from under the booms and under leaking pipes or valves. PILLOWS, 2 x 460mm x 460mm- Use to absorb larger spill areas, behind the booms to absorb the bulk of the spill. Ideal for under leaking pipes, valves, gaskets or other leaking equipment. DISPOSAL BAGS + cable tie, 8 x 800 x510mm- For use in the clean up stage. Used absorbents must be placed into bag until half full, then tie off with knot for transportation or movement. PVC GLOVES x 2, DUSTPAN and BRUSH x 1 use when handling spills.